SSD Profitable Practice Bootcamp Video Library! THE FUTURE PROFITABILITY OF YOUR PRACTICE IS AT RISK! No doubt you are aware of the dreadful state of affairs in operating a Social Security Disability Practice. Times are harder now than they have ever been. I was thinking that there was something missing. Unless you can figure out how to run a “profitable” SSD practice with a healthy bottom line, the NOSSCR information is not going to be of much help! I have a few questions for you. Are your profits down significantly over the past several years? Do you think we have seen the last of attacks on our Social Security Disability Practices? Are you tired of going to hearings and seeing over half the docket taken up by the out of state National firms? Is it getting harder and harder to win cases before the (re-educated, retrained) ALJ’s? Are you finding it more difficult every day to get good new clients due to the bombardment of marketing by the large national SSD law firms? The truth is, it is getting harder to make a living – much less a sizable profit – practicing SSD law. Lawyers across the country are telling me they are barely getting by. The challenges of running an SSD practice mount by the week, while profits have sunken to an all-time low. They are scared! And rightfully so. What is the answer? To survive, you need to know how to better run your SSD practice to increase the effectiveness of your marketing expenditure, reduce your costs and increase overall efficiency. 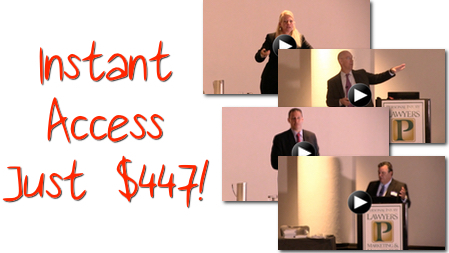 “The SSD Profitable Practice Bootcamp” is the solution to your worries. We have assembled a roster of speakers and a Blueprint on how to turn your SSD practice around. Our secrets will help you turn a potential year-end loss into a healthy profit. How would you like to learn how to get more cases at a cheaper price than your competitors? In this intensive Bootcamp we will show you exactly how to do it. No fluff, just real, action-packed steps. For example, we’ll show you how to get signed new cases from as little as $55, up to $460, depending on your market. If you are not completely satisfied that you received 10 times the amount you paid in practice growing information and secrets, we will gladly refund your entire purchase price. No Questions Asked! P.S. Don’t forget our 100% Iron Clad Money Back Guarantee. What have you got to lose?